A Grand Canyon Rim to Rim hike is one of the most popular backpacking trips the Grand Canyon has to offer! 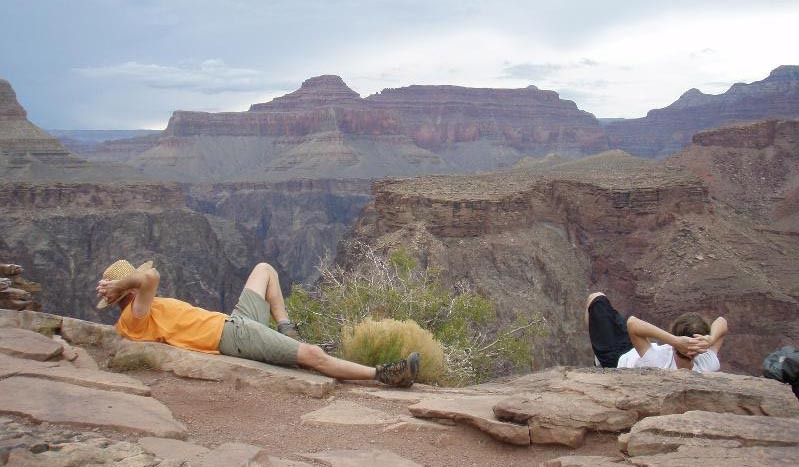 A Grand Canyon Rim to Rim hike allows you to experience breathtaking views and the vast expanse of the canyon. There are few experiences more spectacular than seeing both the North and the South Rims at the same time from the bottom of the canyon. This Grand Canyon hiking tour has you backpacking from over 8,000ft in elevation from the North Rim to the almost 7,000 ft South Rim. Along the North Kaibab trail (pronounced KY-bab where KY rhymes with Eye and bab rhymes with cab) we will pass a couple waterfalls (Roaring Springs and Ribbon Falls), hike along Bright Angel Creek, visit Phantom Ranch, dip your toes in the Colorado River and see evidence of ancient civilizations that once called Grand Canyon their home. 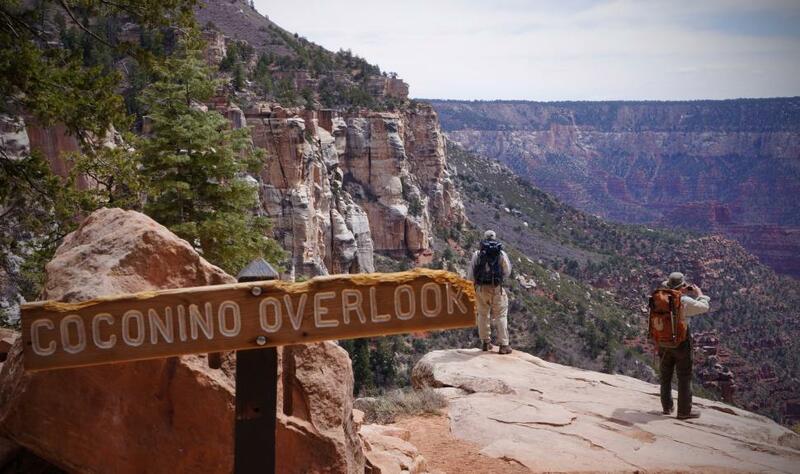 Since the road to access the North Rim does not open until May 15th of every year and is closed through the winter months, there is a small window of opportunity each year to complete a Grand Canyon Rim to Rim hike (unless you decide to hike Rim to Rim to Rim). This trip is great for the first time backpacker that has an above average level of fitness. You are hiking the main trails of the canyon where there are amenities at most campsites such as toilets, running water and even a canteen at Phantom Ranch where you can buy a lemonade or a Snickers bar! These trails are also well maintained and considerably wider than most other trails in the canyon – over 6 feet wide in most places. * Plus, the Rim to Rim hiking trip is one of the two trips you can do in the summer months (June through August) since there is ample shade, water and creeks to stay cool and hydrated. AND, with our outfitting services for your Grand Canyon backpacking trip, your experience will be more enjoyable as we will do the footwork for you. Click here for more information about JRI’s outfitting services. **Spoiler Alert** If you are looking to experience Grand Canyon and all its amazingness without 100s of people, this is NOT the trip for you. You will be on the trails with 100s of other hikers – especially during the peak months of May, September and through mid October. Plus, Bright Angel camp and Phantom Ranch can cater to 200 people per night. Popularity + amenities = lots of people! Need more information about the trails? Click the below links for the official South Kaibab, North Kaibab and Bright Angel Trail descriptions from Grand Canyon National Park. *Please note: Due to the high demand and limited supply of permits available for the Grand Canyon Rim to Rim camping areas, we recommend having flexibility in your dates and open to alternate camp areas. We also recommend planning this hike at least five months in advance. 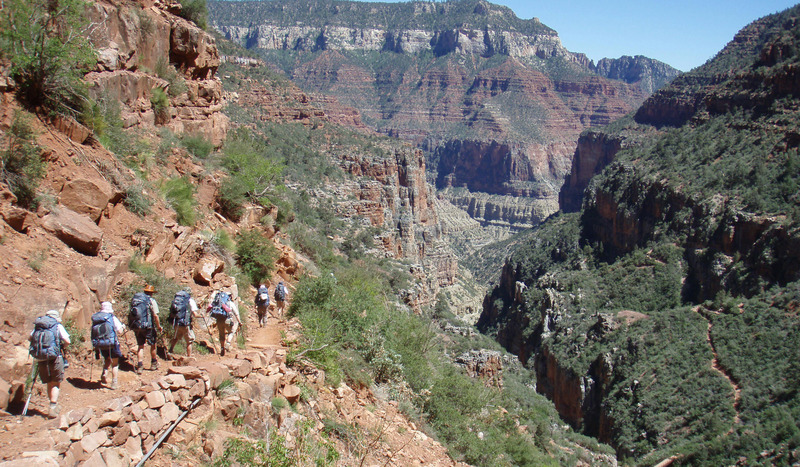 If you would prefer a hike from the South to the North Rim, we can help you plan that as well! From the North Kaibab trailhead, the hike into the canyon along the North Kaibab Trail to Cottonwood Campground is 7 miles (11.26 kilometers) long with a 4,200 foot (1280 meters) drop in elevation. The average time to reach camp is about 5-6 hours and once you are there, it is a treat to get into the Bright Angel Creek to cool down on hot days or wander along the shore for a relaxing evening. Follow the remainder of the North Kaibab Trail along the Bright Angel Creek 7 miles (11.26 kilometers) and 1,500 feet (457.2 meters) down to Bright Angel Camp. 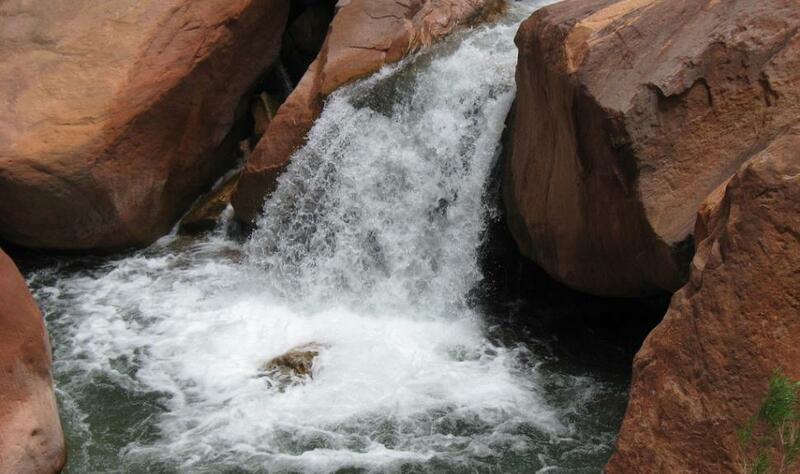 On the way, make time for a side hike to Ribbon Falls – a 100 foot water fall that spews out of a side canyon. 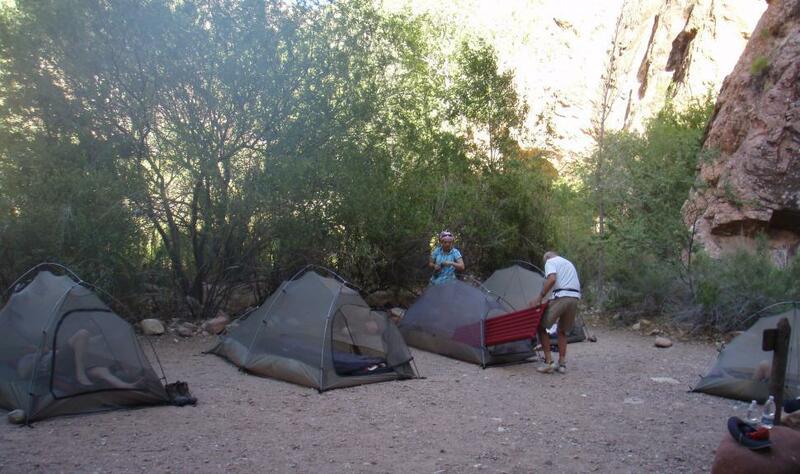 Bright Angel camp is nestled between the Colorado River and Bright Angel Creek. This hike takes 5 hours to reach Bright Angel Campground. Start the hike out of the canyon along Bright Angel or South Kaibab Trail, reaching one of three possible camps for the night. The hike is 1,400 ft (426.72 m) up in elevation to either a secluded camp with open skies or not so secluded along the main trail. Either way, you will enjoy a stunning sunset, extensive panoramic views miles wide from the inner canyon and down to the Colorado River. This part of the hike entails a 3,000 ft (914.4 m) increase in elevation. It takes the average group 4.5 hours to complete, reaching the Grand Canyon’s South Rim and Grand Canyon Village. As you get closer to the South Rim of the canyon, whether along the South Kaibab or Bright Angel Trails, expect to see A LOT of people straight off the tourist bus!